The social media-activated vending machine will be back in Wright State’s Student Union Atrium Oct. 3-5 as part of Homecoming Week. Hundreds of Wright State University students posted to Twitter and Instagram for free Raider gear last year during Homecoming Week. Good news: The popular social media-activated vending machine will be back. And there’s even more in store this year: the claw. 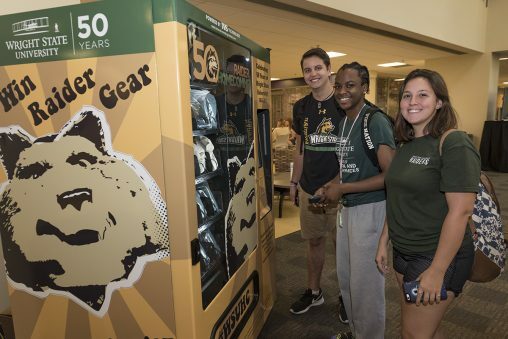 Students can take their chances at operating a claw-type carnival game that dispenses Wright State merchandise. The vending machines will be available in the Student Union Atrium from 11 a.m. to 3 p.m. on Wednesday, Oct. 3, and Thursday, Oct. 4, and from 11 a.m. to 2 p.m. on Friday, Oct. 5. Wright State’s social media team will assist students with the giveaway. Jeff Thibodeau, who graduated from Wright State in 2007, co-founded Innovative Vending Solutions, which will supply the machines as part of Wright State’s Homecoming Week October 1-6. The vending machine has a touchscreen on the front that provides instructions to the user. To get a free item, the user is asked to post a message or photo on Twitter or Instagram, including a designated hashtag, from his or her smartphone. As soon as the post hits Twitter or Instagram, the screen on the machine changes to vending mode and dispenses a Wright State shirt or hat. The claw machine operates in a similar fashion, giving the user a free opportunity to play to win Wright State items, including plush and other branded merchandise. Last year, many students posted photos of themselves standing in front of the vending machine, which helped create buzz about Homecoming and increased followers for Wright State’s social media accounts. Thibodeau grew up in Springboro and after graduating from Springboro High School, attended the University of Cincinnati for a year before transferring to Wright State, where he graduated with a bachelor’s degree in business marketing in 2007. Innovative Vending Solutions has supplied vending machines for more than 300 businesses, organizations and nonprofits. Growing in popularity, the machines can be found in shopping malls, sports venues, trade show booths and even on piers. Wright State was the first university in the region to have one of the vending machines last year. To follow the excitement online for this year’s Wright State Homecoming, follow the hashtag #WSUHC on Twitter and Instagram.